American Jordan Spieth won the AT&T Pebble Beach Pro-Am by four shots for his ninth PGA Tour title. Spieth is the second youngest player to reach the landmark at 23 years and six months, a month later than 14-time major winner Tiger Woods. The two-time major winner carded a two-under-par 70 to finish on 19-under, with American Kelly Kraft in second after he shot 67 in the final round. World number one Jason Day of Australia shot a 67 to finish fourth on 12-under. The Masters, the first major of the year, takes place in Augusta from 6-9 April. Victory in California means Spieth is the only player in PGA Tour history to win by three strokes or more, five times before the age of 24. The Texan, who had led since the halfway stage, hit two birdies in his bogey-free final round, including one from 30ft on the par three 17th. He managed to play the final 28 holes of the tournament without a bogey. 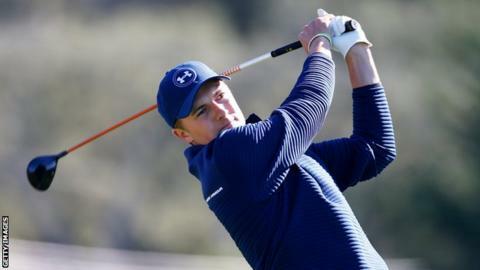 "I could afford to make a couple of mistakes today if I needed to but fortunately I didn't and managed to stay ahead," said Spieth, who won his first tournament since the Australian Open last November. "It was just kind of a dream round when you are leading by a bunch. I finally got one [a birdy] to go in at 17." "I kept saying, 'I don't like playing boring golf,'" he added. "But that's what was needed today and that's how we closed it out." American and world number four Dustin Johnson was third on 14-under. Spain's Jon Rahm, who won his maiden PGA Tour title at the the Farmers Insurance Open in January, was fifth on 12-under. Luke Donald was the highest placed Briton, tied for 23rd on six-under, with Olympic champion Justin Rose two shots back.